After our Summer Tour ends, we're taking a short break and then going back out on tour from August 15 - September 30, 2018 on our NEW Chaos on Wheels Tour. Tour stops will include gymnasiums, parking lots, and other flat-level surfaces with 20 feet of clearance from floor to ceiling. Also new for 2018 is we will be performing school assemblies on this tour for only $500 per school! We hope you'll allow us to impact as many schools in a 20-minute radius as possible when we're in your area! Click on our Contact page to find out more! The 2018 "Amped" Summer Tour was announced today. 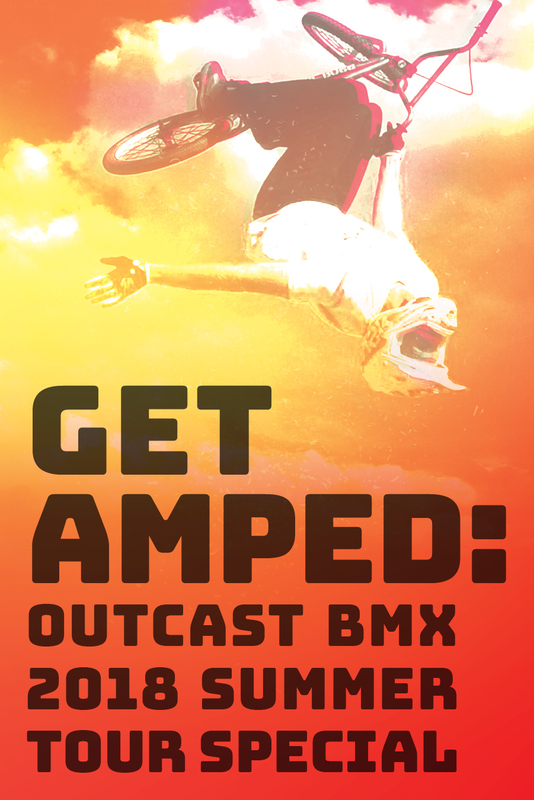 Outcast BMX, America's #1 Christian BMX Team will be touring with full ramps next summer to perform at churches, festivals, camps, VBS, celebrations, and more to share a message to LIVE FULLY ALIVE in Jesus. Find out more by calling (615) 258-4646 or by contacting the team HERE. Insurance - Every team must carry a general liability policy that covers them in case of injury during their show. Typically a $1M will suffice. Ramps - Make sure the team you bring in can do big tricks off of ramps that are 4ft or higher. 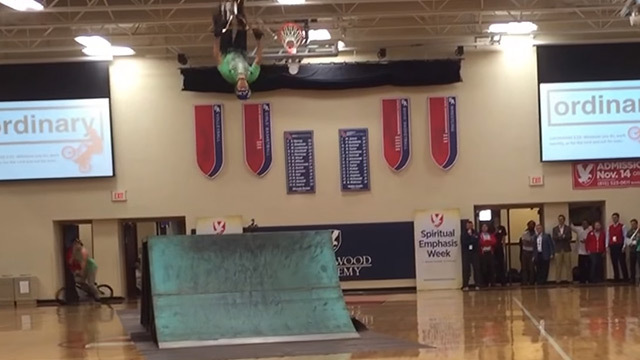 Backflips, Tailwhips, Superman Seatgrabs, etc. This is what people come to see. Riders - Make sure the team you bring in has at least 3 riders for a Big Ramp Show. Each rider will be fatigued so imagine you can get 10 minutes of great tricks from a well-seasoned rider, so if you bring out 3, you've got at least 30 minutes of great tricks. Professionals - The riders you bring should be professional meaning they have a high skill level and the endurance to get through a show. Our riders are seen in Dew Action Sports Tour, Red Bull Tour, Barnum and Bailey Circus, ESPN, X-Games, and more. Amateur riders will put on a bad show, can perform worse as the show goes on and are more likely to be injured. Costs - The biggest cost outside of the honorarium is distance that will be traveled. Schedule a team that is within 8 hours of you or that is already coming nearby to save significantly on costs. Since we have five teams based in California, Arkansas, Missouri, North Carolina, and Florida, your costs will likely stay low with us. New look, new site, new tour. We're excited to launch our new look just in time for the OBMX 2016 Fall Tour! We'll be embarking on tour throughout the US this fall so check back to see what we're up to as we perform our critically acclaimed show for public schools & churches across the country. Outcast BMX is owned and run by Gresham Hill Management, Inc. (“Company” or “We”). We respect your privacy and are committed to protecting it through our compliance with this policy. the types of information we may collect or that you may provide when you download, install, access or use www.OutcastBMX.com (the “Website”) and the Outcast BMX mobile app (the “App”, and together with the Website, “Outcast BMX”); and our practices for collecting, using, maintaining, protecting and disclosing that information. This policy applies only to information we collect on the Website and in the App and in e-mail and other electronic communications sent through Outcast BMX. we collect offline or on any other Company apps or websites; or you provide to or is collected by any third party, including through any application or content (including advertising) that may link to or be accessible from the Website or the App (see Third-Party Information Collection). Our other websites and apps and these third parties may have their own privacy policies, which we encourage you to read before providing information on or through them. The Website and the App are not intended for children under 13 years of age, and we do not knowingly collect personal information from children under 13. If we learn we have collected or received personal information from a child under 13 without verification of parental consent, we will delete that information. If you believe we might have any information from or about a child under 13, please contact us at privacy@Outcast BMX.com. You may provide information to be published or displayed (“Posted”) on public areas of the Website or the App (collectively, “User Contributions”). Your User Contributions are Posted and transmitted to others at your own risk. Although certain contents of your personal profile are designed to be visible only to your friends, please be aware that no security measures are perfect or impenetrable. Additionally, we cannot control the actions of third parties with whom you may choose to share your User Contributions. Therefore, we cannot and do not guarantee that your User Contributions will not be viewed by unauthorized persons. Usage Details. When you access and use the Website or the App, we may automatically collect certain details of your access to and use of the Website or the App, including traffic data, location data, logs and other communication data and the resources that you access and use on or through the Website or the App. Device Information. We may collect information about your computer equipment or mobile device and internet connection, including the device’s unique device identifier, IP address, operating system, browser type, mobile network information and the device’s telephone number. Stored Information and Files. The App also may access metadata and other information associated with other files stored on your device. This may include, for example, photographs, audio and video clips, personal contacts and address book information. Location Information. The App may collect real-time information about the location of your device. If you do not want us to collect this information, do not visit the Website and either do not download the App or delete it from your device. You may have the option to opt out of location sharing by adjusting the privacy settings on your mobile device. Note, however, that opting out of the App’s collection of location information will cause its location-based features to be disabled. Cookies (browser or mobile cookies). A cookie is a small file placed on the hard drive of your computer or on your mobile device. You may refuse to accept browser cookies by activating the appropriate setting on your browser, and it may be possible to refuse to accept mobile cookies by activating the appropriate setting on your mobile device. However, if you select this setting you may be unable to access certain parts of Outcast BMX. Web Beacons. Pages of the Website, the App and our e-mails may contain small electronic files known as web beacons (also referred to as clear gifs, pixel tags and single-pixel gifs) that permit Company, for example, to count users who have visited those pages or opened an e-mail and for other related statistics (for example, recording the popularity of certain content and verifying system and server integrity). These third parties may use tracking technologies to collect information about our users. This may include information about users’ use of the Website or the App and other apps and websites to serve them interested-based (behavioral) advertising. We do not control these third parties’ tracking technologies or how they may be used. If you have any questions about an advertisement, you should contact the responsible advertiser directly. For information about how you can opt out of receiving targeted advertising from many providers, see Choices about How We Use and Disclose Your Information. recognize you when you use Outcast BMX. We use location information we collect to enhance the user experience within the App. We may also use your information to contact you about our own and third parties’ goods and services that may be of interest to you. If you do not want us to use your information in this way, please adjust your user preferences in your account profile. For more information, see Choices about How We Use and Disclose Your Information. Location Information. You may be able to choose whether or not to allow the App to collect and use real-time information about your mobile device’s location through the mobile device’s privacy settings. If you block the use of location information some parts of the App may then be inaccessible or not function properly. Promotional Offers by Company. If you do not want us to use your contact information to promote our own or third parties’ products or services, you can opt-out by sending us an e-mail stating your request to privacy@Outcast BMX.com. Targeted Advertising by Company. If you do not want us to use information that we collect or that you provide to us to deliver advertisements according to our advertisers’ target-audience preferences, you can opt-out by sending us an e-mail stating your request to privacy@Outcast BMX.com. Disclosure of Your Information for Third-Party Advertising. If you do not want us to share your personal information with unaffiliated or non-agent third parties for advertising and marketing purposes, you can opt-out by sending us an e-mail stating your request to privacy@Outcast BMX.com. You can review and change your personal information by logging into Outcast BMX and visiting your account profile page. The Website and the App may contain links to other websites. Company is not responsible for the content, privacy policies, products, services, reliability, viewpoint, or accuracy of information on any such websites. We do not control and shall not be responsible for the collection of personal information by third-party websites, including websites owned or controlled by our distributors, vendors and/or websites not controlled by Company. Third-party websites that are accessed through links on the Website or the App have separate privacy policies. We have no responsibility or liability for the policies implemented by third parties on their websites. You should contact them directly to ask questions about their privacy policies. The safety and security of your information also depends on you. Where we have given you (or where you have chosen) a password for access to certain parts of Outcast BMX, you are responsible for keeping this password confidential. We ask you not to share your password with anyone. We urge you to be careful about giving out information in public areas of Outcast BMX. The information you share in public areas may be viewed by any user of Outcast BMX. Unfortunately, the transmission of information via the internet and mobile platforms is not completely secure. Although we do our best to protect your personal information, we cannot guarantee the security of your personal information transmitted through Outcast BMX. Any transmission of personal information is at your own risk. We are not responsible for circumvention of any privacy settings or security measures we provide. U.S. Mail: Gresham Hill Management, Inc.